It's time to get down and dirty in the diamond mines. Click here to play! Search the depths of the earth to dig up massive diamonds and reap the innumerable rewards that will be coming your way. As a prospector you're going to have to collect big dollars to fund your efforts. 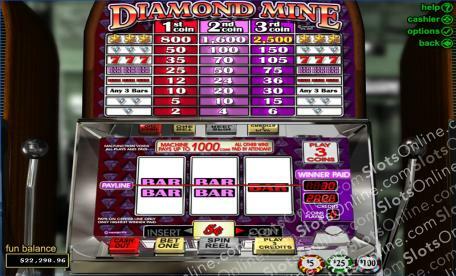 If you are lucky enough to spin three dollar signs across the pay line, you'll win up to 2500 coins! Diamonds also pay off big. Three of these jewels across the pay line will pay up to 150 coins. You'll also find pretty decent wins with lucky sevens, which pay off up to 105 coins, and double bars, which pay off 75 coins. There are also a few other combinations that will fill your moneybag with plenty of loot. Gear up for a busy day in the mines. You never would have guessed that spending a day prospecting for diamonds and cash would be so much fun. So, dig up your diamonds for a nice, big profit.